US Specialty Vehicles (USSV) is a company located in Rancho Cucamonga, California and they are specialized in producing luxury sport utility vehicles. Their Rhino GX was a big hit, but it was simply too big and too bulky for some people to handle. 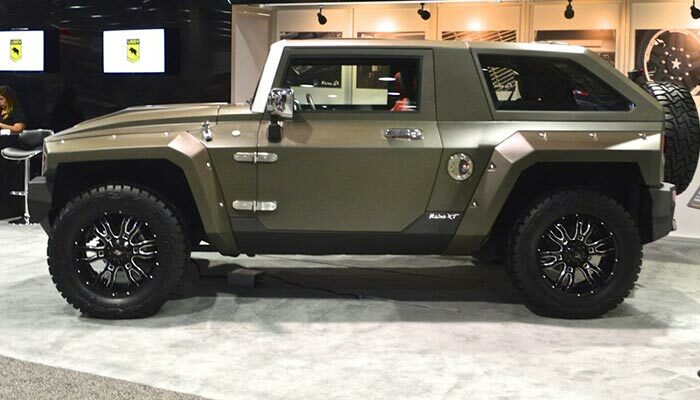 So, the California-based company decided to create Rhino XT, an all-terrain SUV that is basically just a smaller and more subtle version of the mentioned GX. The Rhino XT may be smaller than the XT version, but it’s equally mean and aggressive-looking. It’s equipped with a 3.6-liter V6 engine that can produce up to 285 horsepower and a 5-speed automatic transmission. The Rhino XT was built around the Jeep Wrangler Unlimited chassis frame. The mean-looking 20 x 10-in aluminum wheels are covered with 35-inch tires that can be used for both off-road and on-road driving. This all-terrain vehicle is equipped with a 3.6-liter V6 engine that can produce 285 horsepower. 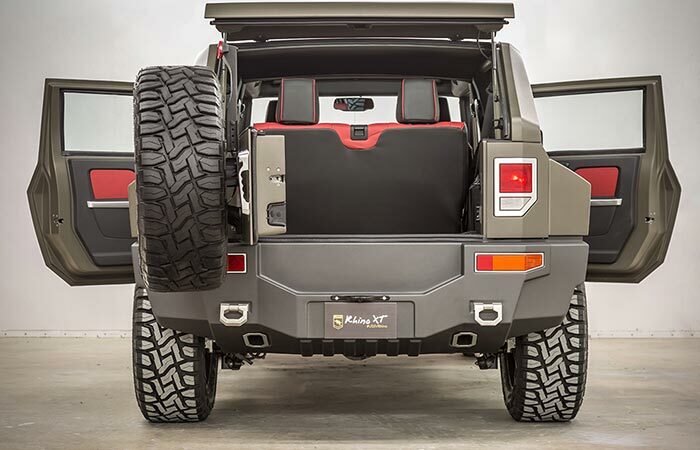 This SUV was built around the chassis of a Jeep Wrangler. Rugged fenders and bumpers are giving this SUV a very aggressive and tough look, but don’t let that fool you, this vehicle has an extremely comfortable interior. The inside of the car is equipped with stylish leather seats, leather-trimmed door panels, European-styled dashboard, Alpine navigation system, leather-wrapped steering wheel and one camera that will assist you to back up with ease. 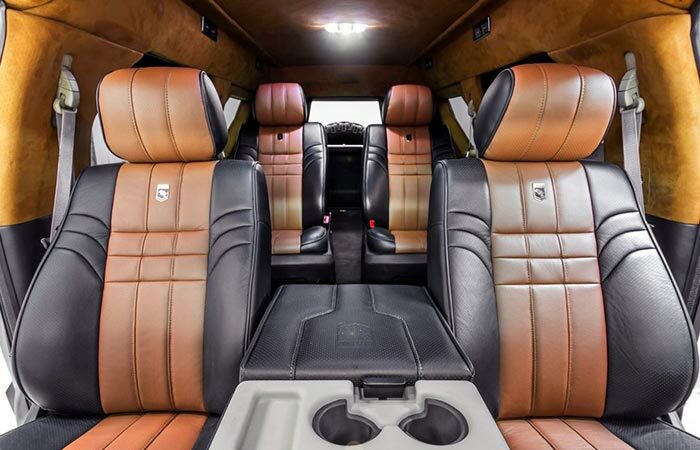 Interior is equipped with four leather seats with the USSV markings. Rhino XT has a removable roof top and fender flares. The Rhino XT also has a removable roof top with tinted glass and removable fender flares, so you can modify the outside look of your car with your own taste. It’s packed with a tank that can carry up to 22.5 gallons of fuel and it has a seating capacity of 4 passengers. This all-terrain SUV will set you back $75,000. 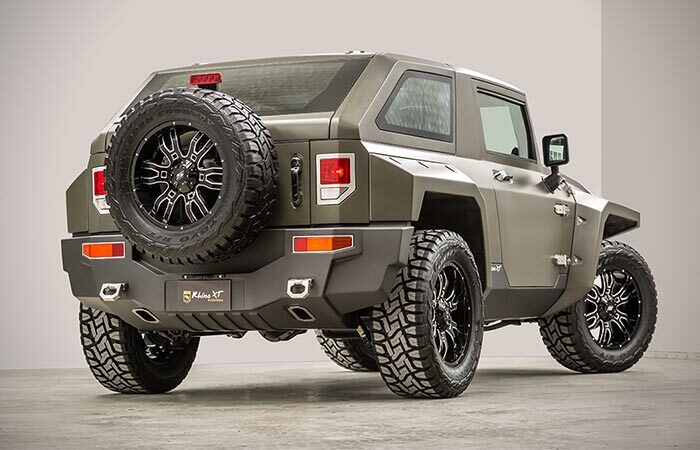 This army-looking all terrain SUV costs $75,000. Check out the Rhino XT by US Specialty Vehicles here.